Late night. The crickets sings. I don’t sleep. I wake, light a candle, and read beautiful Hafiz poems and Koran. My cabin is a cranium, the door a mouth, and the deck its tongue. I walk out of the head, through the mouth, onto the tongue, and fall into space as a song. Quiet settles in me. It grows too cold for the cricket. 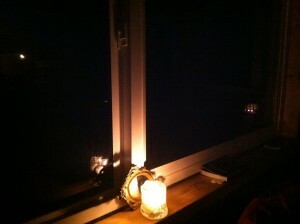 I close the window and lean toward the candle. Ravenrock’s beauty—others rhapsodize more than I do. I huddle in Her quiet. A shriveled creature, I wait to uncrumple. Ravenrock lets me rest on her cheek while she sings. I am a tear. Wind, blow me away. I may fall like old flesh off the rock cliff bone. I go for a walk. Ponderosa’s vanilla perfume, sheer after the rain! I press my nose into the long, sap-glistened rent in her bark, then trace a rock’s pale green lichen upholstery before I sit. My feet rest on spongy pine needle carpets. I need this palace. I need the choirs and light shows—that huge movie playing every evening from the seat on my deck. “Peace, break my sadness, rage, guilt!” I’ll dump these false troubles, these holdings. I will. “You carry all the ingredients to turn your life into a nightmare—Don’t mix them! You carry all the ingredients to turn your existence into joy. Your words make my heart yearn to be there, solitude, joy, peace and the loving sweetness of all the Mother has to offer. Ah, Dunya, what sweet songs you write to us…..
Rick shared the photos of your barn raising and it is just awesome!!!! I am so glad your dreams are becoming reality and that you are happy with your commune with life and nature in new mexico. Best of luck and lots of joy – stay away from the tarantulas EWE!! !